Tricky Treats is a world first automatic toy and treat dispenser that helps alleviate loneliness and boredom in your dogs when you are not at home. Tricky Treats was developed by dog lover Cherelle Witney as her Beagles were causing havoc whenever they were left alone! “I was coming home from work every day to a trashed house and annoyed neighbours complaining about my dogs barking,” Ms Witney said. “They say necessity is the mother of all invention and Tricky Treats is exactly that” she said. 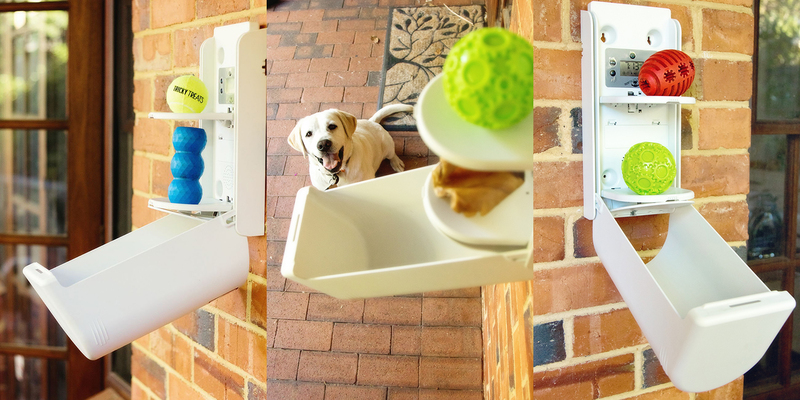 Tricky Treats is a wall-mounted device that you load and set to throw out toys or treats when you are not home. 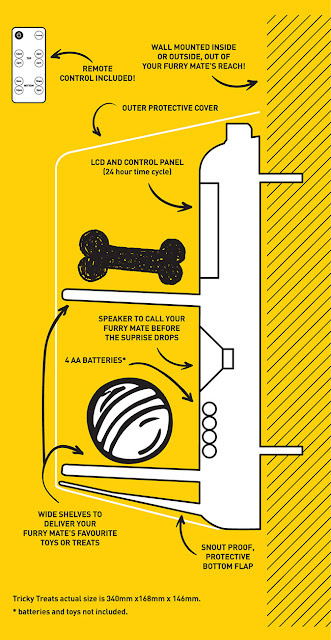 It also has a voice recorder, so it’s your voice your dog will hear calling it to come and fetch their surprise. There are more than 4.8 million dogs in Australia and around 20 per cent suffer separation anxiety when you are gone, which can increase as dogs age. Animal Behaviourist Shae Holden said enriching a dog’s environment with random reinforcement is the best form of training and entertainment. “Tricky Treats is the first device of its kind in the world that dispenses fun and enriching toys and treats from a container mounted on an inside or outside wall of your home, at pre-programmed times,” Ms Holden said. “It helps dogs to stay happy and positively occupied during the day,” she said. Tricky Treats inventor Cherelle Whitney said customers have been amazed at how quickly the device helped stop or reduce their dog’s misbehaviour due to loneliness. See it in action as it makes its television debut on Channel 10’s Shark Tank on Tuesday 31st July 2018 at 9:55pm. How does Tricky Treats work? Wall-mounted dispenser - It automatically releases toys or treats at pre-recorded times through the day. 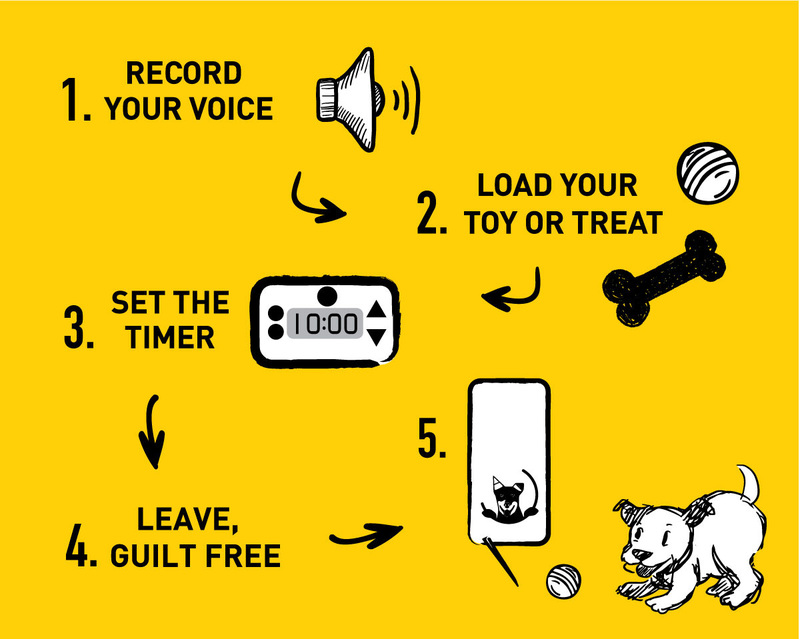 Voice Recorder - You record a personalised message to call your dog closer when it’s time to fetch. Toys and treats - You decide what goes inside, with the chamber designed to hold most medium sized toys. Alleviates boredom - Provides a variety of mental or physical activities every day which can help reduce or even stop bad behaviour in your dog like digging or excessive barking. Reduces separation anxiety - For you and your dog, both knowing time apart is now filled with surprises. Tricky Treats is a proud supporter of the RSPCA and SAFE (Saving Animals From Euthanasia). Cherelle is a dog lover and a leadership and team development consultant whose keynotes focus on “The Courage to Create”, two skills she’s found invaluable as an inventor. Cherelle also volunteers as a mentor to students in high school programs such as Just Start It and Imaginarium supporting them to start their invention journeys early. It encourages them to think creatively, be agile team members and be confident and courageous with their ideas.